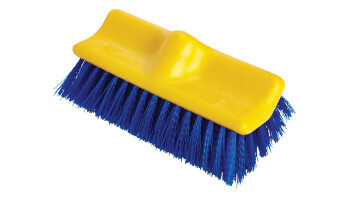 A large selection of commercial brushes in a variety of shapes and sizes to tackle any task. The Rubbermaid Commercial Maximizer™ cleaning tools help workers save time by reducing steps in a task, reducing the time of a step and reducing user effort. Engineered to last and designed to perform in a variety of common spaces, Maximizer cleaning tools deliver fast, consistent results shift after shift. 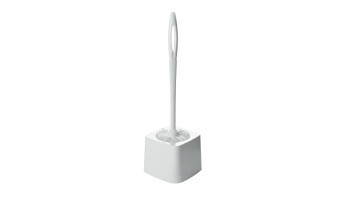 The Rubbermaid Commercial Toilet Brush Holder fits Rubbermaid Commercial toilet brushes (sold separately). 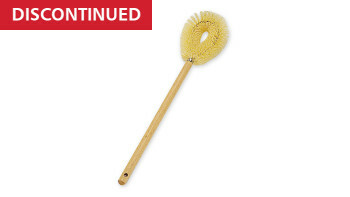 The Rubbermaid Commercial Toilet Brush with Hardwood Handle is ideal for commercial, medical, and industrial applications. 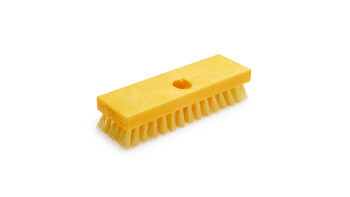 Plastic Block Counter Brush FG634200 is a counter brush with a structual foam block. 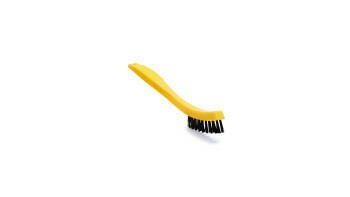 The brush has yellow polypropylene fiber bristles and a yellow plastic structural foam block and handle. Block won't crack or warp and resists bacteria growth. 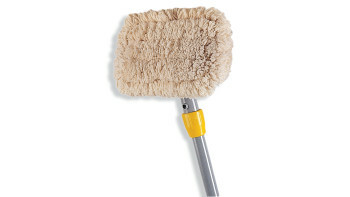 Use for general cleaning and scrubbing in wet or dry conditions. 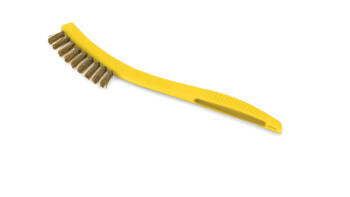 Iron Handle Scrub Brush FG648200 is a high quality scrub brush designed to make scrubbing easier. For efficient removal of rust, paint and grease. 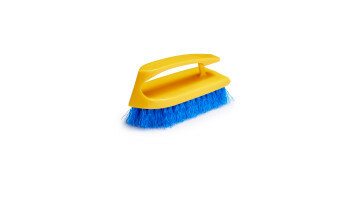 Wire bristles tackle tough cleaning jobs. Set in plastic block. 8-1/2" overall length. Convenient hole for hanging. 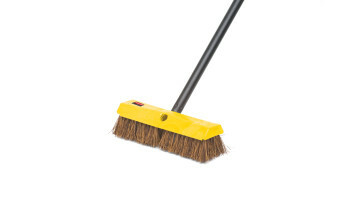 Deck Brush FG9B3600 is a high quality deck brush. Plastic block resists splitting and delaminating. 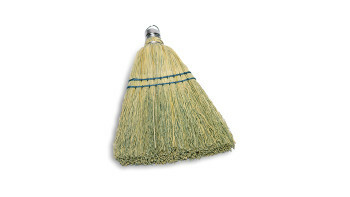 The Rubbermaid Commercial Floor Scrub Brush features bi-level polypropylene bristles that are stain-resistant. 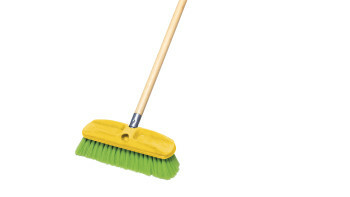 Deck Brush FG9B3400BRN is a high quality deck brush. Plastic block resists splitting and delaminating. Flagged synthetic fibers with palmyra fill help avoid scratching. 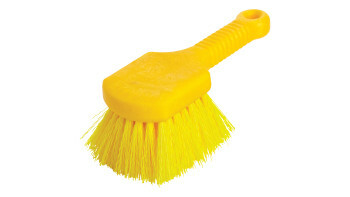 Long-lasting, stain-resistant polypropylene bristles. 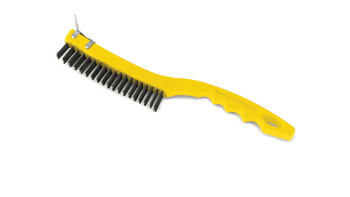 Polystyrene bristles are resistant to water, wear, and shearing. Bristles are split-tipped to make them softer and better able to trap fine dirt particles on smooth surfaces than regular bristles. 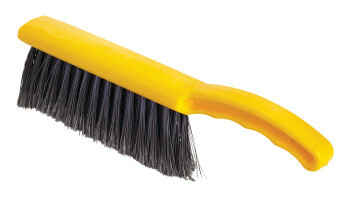 This brush has steel wire bristles. 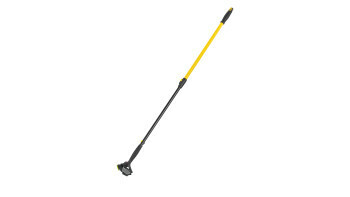 Long plastic handle. 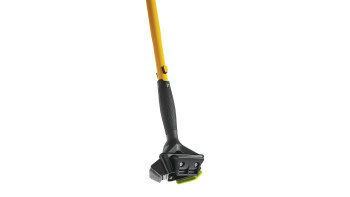 Includes a scraper for those needing extra cleaning power. 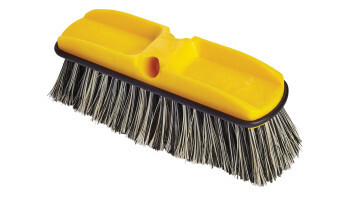 14-inch length, 3-inch by 19-inch bristle pattern. The wall washer kit features an aluminm handle with a pivoting head for smooth, even control. The raised-ribbed design works with either side pressure or downward pressure mop wringers, and the pads can be removed easily for convenient washing, making them ideal for commercial use.